England coach Martin Johnson insists he is relaxed over his players talking about winning the Grand Slam ahead of Saturday's key match against Ireland. "We haven't banned anything and that includes talking about a Grand Slam," said Johnson. "We've never said 'don't mention the Grand Slam'. "We all know what is at stake now and what we want to do. We will be talking about how to beat Ireland. "We go away to probably the toughest place to play right now in Europe." Victory in Dublin on Saturday would give England their first Grand Slam triumph since 2003 when Johnson was captain, a feat which gave them the impetus to win the World Cup for the first time later that year. 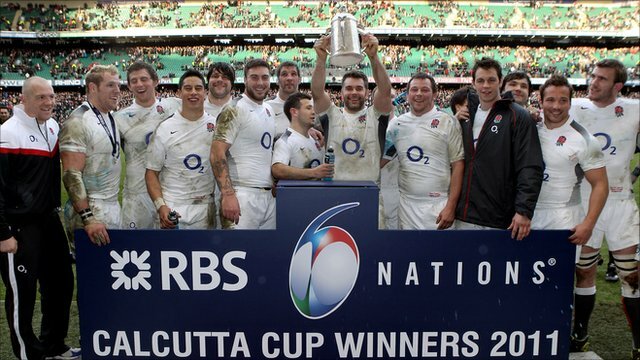 "Winning a Grand Slam goes down in the history books," added England full-back Ben Foden. "It shows where England have come from. "A couple of years ago we were struggling a little bit, always coming third or second but never really looking like winning it. "This year we went in as favourites after the autumn and we've backed it up. We are not the finished article, but as long as we keep winning no-one can really argue with that. "There's been a buzz around the camp since before the Scotland game that we are playing [for a Slam]. Everyone's always sort of said 'You can't talk about it' but it's always been in the back of your mind." On Sunday, England struggled to put away Scotland at Twickenham but eventually won 22-16 to make it four wins in four games. "We've got lots to be better at," said Johnson. "We know we can play a lot better than that. "We'll be in a fight [against Ireland] and we've got to make sure we are a bit smarter the next time we play." The England boss said the tough win against Scotland would keep his players' and coaching staff's feet on the ground going into the crucial clash against the Irish. "I'd be happier in a way going to Dublin next week off the back of that game rather than scoring a lot of points and having it easy. It focuses everybody's mind," stated Johnson. "When everyone is telling you how good you are, it can leak in a little bit. "We've won four from four in the championship. It will be good to go away for a real tough game in Dublin. We've had three on the trot at home, two of which we have been heavy favourites for. "It's good to go away and play Ireland. They will be smarting after losing to Wales [but] it's a cracking game for us to play. We've earned it." Johnson added: "We want to win every game and the consequence of that is winning the title. "We can all sit there dreaming about winning stuff but it is about the process. We are not not talking about the Grand Slam, we are talking about how we beat Ireland." Flanker Tom Croft said England must maintain their focus if they are to complete their Grand Slam mission at the Aviva Stadium on Saturday. The Leicester player, back in the squad after injury, came off the bench to score the only try in England's hard-fought victory over the Scots, and commented: "It was great to be back involved with a squad that is going well and hopefully we can finish the job off now. "We are in a good place, four from four and a chance of a Grand Slam. We need to be focused and not let the whole event get on top of us." England's points difference is so much better than nearest rivals Wales they should be crowned Six Nations champions even if they lose in Dublin. Ireland are out of the title race after their controversial defeat by Wales, who are mathematically the only team who can catch England. "The Irish will be very dangerous with the Triple Crown gone," Croft added. "They will want to spoil our party." Meanwhile, England have delayed any announcement on skipper Mike Tindall's availability for Saturday's match until Tuesday. The Gloucester centre was forced off at the interval against Scotland with an ankle injury. "It is never nice coming off at half-time," Tindall said. "I just rolled my ankle and it is not worth risking it when you have someone like Matt Banahan to come on." If Tindall is ruled out of the Dublin clash, Nick Easter would be the leading candidate to captain England.